Your statewide union has a political fund-raising arm called VOTECOPE. 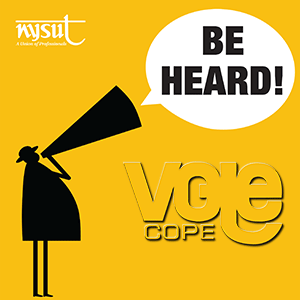 VOTE-COPE is NYSUT's non-partisan action fund that coordinates the voluntary contributions of members and supports NYSUT-endorsed candidates and campaign committees that are pro-public-education and pro-labor. No NYSUT dues dollars are used to support candidates or campaign committees. NYSUT sends rebates to local unions based on a percentage (up to 40 percent) of the contributions VOTE-COPE receives from that local union's members. Those rebates can be used in local activities such as school board races and for passage of school budgets. Last year, your colleagues contributed nearly $8 million to VOTE-COPE. You can ask your local president how to participate.